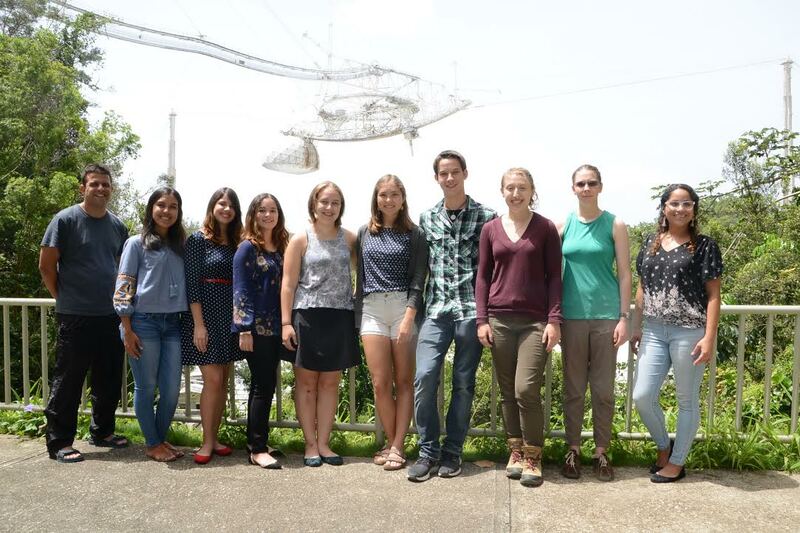 The Arecibo Observatory Research Experience for Undergraduates and Teachers program is funded by the National Science Foundation under grant number AST/1559849. Students and Teachers selected for the program will work with staff scientists on projects related to ongoing research or instrumentation development. Students will be exposed to the interdisciplinary character of this unique research facility through lectures by the staff and visiting scientists, seminar series, tours of the observatory facilities and frequent informal discussions with staff and scientists. Students are also expected to have the opportunity to conduct hands-on observing with the 305-m telescope. Participants will receive a $450-per-week stipend and will reside at the Arecibo Observatory (AO) lodging facilities, for ten whole weeks. All meals will be provided. A bonus of our program is the opportunity to explore the extraordinarily beautiful island of Puerto Rico, its culture and environments. Coin operated washing machines and dryers are available for use. Hours: weekdays, after 4:30pm; weekends, all day. Laundry detergent is available for purchase. A kitchenette is located in proximity to the site cafeteria. Open all hours. Hours: Monday through Sunday, 12:00pm until 10:00pm. Pool towels are available upon request. A basketball court is located on site and is available for use by visitors. Open all hours. The AO site cafeteria is located in proximity to the Administration building. Hours of service: Monday through Friday, 7:00am – 5:30pm. A telephone access code may be requested for legitimate calls in connection with AO business, within reason. Applications for the REU/RET program should be made via the online form. You will need to provide the names and email addresses of references who have agreed to write letters of recommendation. We encourage you to fill out this online application form as early as possible so that your references have sufficient time to upload their letters of recommendation. Once you have submitted the online form, your references will be contacted by email and will be provided with a link. They will be able to use that link to upload their letter of recommendation. We expect to make initial offers on March 1, 2019 (and about mid-March for students on the waiting list). The REU/RET summer program is scheduled to run from late May until mid-August. The exact date might differ slightly depending on you and your project mentor's calendars. We generally look for students who are majoring in astronomy or physics, computer science and electrical engineering. Grades are important but so are the student’s enthusiasm, initiative, and future goals. We give emphasis to students with good math and computing backgrounds. See the FAQ page for details regarding the supporting documents. Should contain education details, previous employment, research / lab experiences, technical and programming skills, publications and awards. Maximum of two pages in PDF format. We require an unofficial transcript, to be submitted with the digital application. Official transcript will be required from those selected as participants. If you have multiple transcripts, please combine them into a single PDF file. Please scan the front and back of each printed page of the transcript. Describe your educational background and goals, and your scientific interests and experience. Please include any information relevant to the evaluation of your potential for success as a research assistant in the Arecibo Observatory REU Summer Program. Maximum of two pages in PDF format. We will contact your references directly after verifying your online application. Maximum of two pages in PDF format.